Gardener's Journal, from Gardener's Supply Company. Bakers' Banter, from King Arthur Flour. Alaska Air used their e-mail channel to promote a wine club. REI is promoting ten songs in a recent e-mail campaign. Per Alan Rimm-Kaufman, Wal-Mart ran ads for Presidential candidates on the homepage. We used to be known as catalogers or retailers. Then we were labeled "multichannel". And now we're slowly becoming media companies. When we become a media company, we have a new set of responsibilities. We ask ourselves new questions. Maybe the most important question is "What is the nature of the relationship between customer and brand?" If the customer and brand jointly believe that it is acceptable for the brand to introduce wine and music to the customer, then the brand can further monetize the customer relationship, and the customer can theoretically benefit from new offers. More important, we cannot trade short-term revenue for long-term customer mistrust. Increasingly, we're going to be asked for access to an e-mail list of a million customers, or for access to a mailing list of four million customers --- we're no different than a network television executive looking to monetize a thirty second spot on The Office. We have an audience, we're like a television or cable channel. Brands want to get a message in front of our audience. Do we protect our customers, or do we open the door? And when we open the door, do we open it a crack, or is it wide open? And as response rates plummet, the temptation to take the money will become greater. Executives and customers will have to make joint decisions here, decisions that shouldn't be made solely in a board room. In 2009, some multichannel marketers are going to have to find new jobs. Others will have to filter a veritable plethora of candidates. If you are an interviewer, or you are looking for a job, you might want to be prepared to ask/answer these questions. Question #1: Do you think "CRM" if a four letter word? Question #2: You send a weekly e-mail campaign to your opt-in audience. Your inventory executive wants to add a monthly "outlet" campaign to clear merchandise, one not integrated with those executed by the marketing department. Explain the reasons why you would or would not allow this new monthly campaign to exist. Question #3: The merchandising team is upset because each merchandising leader does not get to feature merchandise equally on the homepage. Some of the merchants are being pressured into improving sales productivity by the CEO. Should their under-performing merchandise get more access to the best real estate in the company, the home page? Question #4: Describe the marketing strategy you would employ with a customer who lives in Butte, Montana, far away from retail stores. Question #5: Describe the marketing strategy you would employ with a customer who lives in a condo off of Michigan Avenue in downtown Chicago. Question #6: What is the role of a catalog marketing program in a modern multichannel brand? Question #7: Your CEO wants to decide where additional money should be spent, either retaining existing customers, or finding new customers. What metrics and facts do you need to determine where to spend marketing dollars? Question #8: Thirty percent of demand flows-through to profit. Your marketing program generated $100,000 in sales, and costs $40,000 to execute. Was the marketing program profitable? Question #9: Under what circumstances are you willing to lose money on a marketing program? Question #10: Should all channels look and feel the same, offering the same prices and promotions and merchandise? Explain your answer. Question #11: Describe one company that is what you would call an "excellent" multichannel marketer. What is it that is "excellent" about the marketing this company does? Question #12: Describe one company that is what you would call an "excellent" single-channel marketer. What is it that is "excellent" about the marketing this company does? Question #13: Is it important for a company to employ industry-standard "best practices"? Question #14: Describe what innovation means to you in multichannel marketing? Question #15: Your retail channel generates $10,000,000 in net sales a year, and $200,000 profit. Your online channel generates $2,000,000 in net sales a year, and $200,000 profit. Should your marketing efforts focus on improving retail productivity, on growing a profitable online channel, or growing the overall brand? Describe your thought process. Question #16: Your CEO wants for you to execute an e-mail campaign where you sell your opt-in e-mail list merchandise from a non-competing company that wants to pay your company $300,000 for access to your list. Your company is losing money. Will you execute the wishes of your CEO, or are you willing to lose your job to not violate e-mail marketing best practices? Question #17: You work for a company that has a catalog advertising channel, an online channel, and a retail channel. Your web analytics guru tells you that paid search campaigns generated a 4.386% online conversion rate in the month of September. Assuming all online data is tabulated in your web analytics package, was your company-wide conversion rate 4.386%? Question #18: If you know that multichannel customers are the best customers, are you willing to shut down what appears to be an unprofitable channel, knowing that the decision is likely to disappoint your best customers? Why? Question #19: Describe the skills that a Chief Marketing Officer needs to have to be an effective multichannel marketer. Question #20: Describe what metrics are needed to illustrate that your company is doing a great job of multichannel marketing. Question #21: Would you accept advertising from non-competing brands on your homepage? Why or why not? Question #22: Is the purpose of a website to drive traffic to a retail store, or to convert visitors into e-commerce buyers? Can a website do both? How? Question #23: If e-mail marketing drives $0.20 per e-mail delivered, while paid search generates $2.00 per click, is e-mail marketing effective? What is the role of e-mail marketing in a multichannel brand? Question #24: How would you lead employees who have two decades of experience in old-school marketing techniques like cataloging, compared with employees who have a few years of experience, but the experience is in online marketing or social media? What role do each set of skills play in your organization? Question #25: Should social media efforts drive a positive return on investment? If you answer no, describe your thoughts. Question #26: Describe the role of radio advertising, newspaper advertising, and television advertising in a modern multichannel brand. Question #27: Describe the role of mobile marketing in a modern multichannel brand. I'm asked a lot of questions by direct marketing CEOs and Executives about where I think the future of our industry is heading. I've prepared a presentation for our business leaders, now you can download this presentation for free. Have you had a chance to read this press release from Williams Sonoma yet? Comp store sales of -26.6% for the month of October? Are you kidding me? We're looking at a -9% comp in Q1, -8% in May, -14% in July, -20% in September, and almost -27% in October. Direct-to-consumer revenue is down as well. Brands have a habit of canning a lot of employees when this happens. There aren't enough variables in a retail environment to improve profitability without bouncing hard-working individuals who did not cause this business downturn. We know that catalog volume was seriously cannibalized by the inception of the internet, we know that internet volume is thwarted by store expansion, and now we have a dominant retail channel that cannot "flex" when the economy implodes. What happens if comps are down by 20% for a full year, especially when a brand is in "hybrid mode"? Take a peek at the Multichannel Forensics simulation below --- one where a brand goes -20% for a year, then sees all metrics return to normal for the next four years. When in hybrid mode, like many retailers are, one bad year causes another two years of sub-standard performance. Even though metrics return to "normal", the loss in file power causes a hangover. When a business plummets like this for a second year, the results are catastrophic --- a -20% expectation in year two becomes a 29% decrease due to file weakness, followed by -16% in year three, -8% in year four, and -4% in year five. The more loyal the customer base, the longer the hangover is. Brands in acquisition mode bounce back much faster. This is why I am hopeful that you will, when possible, keep the gas pedal on customer acquisition during a downturn --- we don't want to crush the future to minimize pain today. We're facing a challenge that is going to be with us for several years. The more "catalog focused" a brand is, the more able the brand is to flex expenses without catastrophic consequences. As a brand migrates online, flexing becomes harder. When a brand goes into retail, the brand goes into the world of fixed costs --- a fixed cost retail brand cannot tolerate -26% comps without eliminating expense. Guess who represents "expense" in a retail environment. Michelle Obama appeared on The Tonight Show on Monday night, where she announced that her outfit was purchased at J. Crew. According to CNBC and NY Daily News, traffic at http://jcrew.com increased by 64%, with traffic to the skirt that Ms. Obama wore increasing by 464%. Here's a link to the outfit, courtesy of The Styleist. J. Crew already had a paid search link up (no competition) on Google. The blogger willing to respond quickly also gets traffic. It's a new, nimble world, a dynamic ecosystem rewarding folks who participate. Maybe you've heard about the implosion of capitalism? Banks did wild things, salaries didn't increase, we borrowed against our homes, and now the infection spreads across the globe. The implosion of capitalism is reflected by the S&P 500 index. We can measure the change in S&P 500, year-over-year, and compare it with the year-over-year change in sales at the company we work for, year-over-year. Let's use Gap as an example. 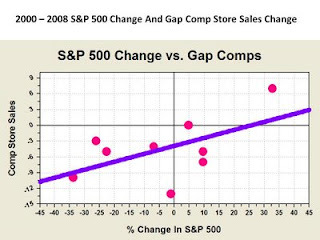 The image demonstrates a relationship (not perfect, but directional) between changes in the S&P 500 and Gap comp store sales. If the S&P 500 drops by 20%, Gap comps drop by an average of 7%. If the S&P 500 is flat, Gap comps drop by an average of 4%. If the S&P 500 increases by 20%, Gap comps drop by an average of 1%. The relationship only has an R-Squared of 31%. But this is good to know, folks!! It suggests that the economy is responsible for about 31% of the change in Gap comps, while issues controlled by Gap employees account for 69% of the change in Gap comps. In other words, Gap management plays a bigger role in the success of the brand than the economy plays. Ultimately, this lousy economy drags Gap comps down by maybe six points. As Executives, we have to communicate a message of hope to our employees. The goal should include a ten percent improvement, so that when the economy drives the business down by six points, we still achieve a four point increase. Improvement is achievable! Every one of us can run this analysis for the businesses we work at. S&P 500 data is freely available, and our own annual sales performance (retail, online, telephone) is freely available. The x/y non-linear regression fitting software (Curve Expert) is freely available. Go analyze your business, and feel comfortable with the notion that you still control the destiny of your brand! This industry leader is frustrated with people like me who recently sent him an advance copy of a newly published book. How would you inform people about your new book, when you know that Amazon won't promote it, and you know that Barnes & Noble and Borders have zero interest in carrying the book? You tell me --- if you were me, how would you market the next book I write? What is an appropriate price point? What is an appropriate cross-channel platform (paperback, hardcover, e-book, mp3 audio, give away free digital copies but charge for dead-tree versions)? How would you market a modern book? Or are books finished, just write stuff on the blog and hope money magically arrives, or take the advice of the author and condense the message to 800 words in a trade journal? If you like marketing books, here's a few from folks who've been very kind to me in the past. Web Analytics An Hour A Day, by Avinash Kaushik. A well-done book by a humble individual who donates the proceeds of the book to charity. The Numerati, by Stephen Baker. Best Practices In Multichannel Operations And Fulfillment, by Curt Barry. Curt and his team assembled a series of articles in this new text. Multichannel Marketing: Metrics And Methods For On And Offline Success, by Akin Arikan. The Truth About E-Mail Marketing, by Simms Jenkins. Maybe your company offers employees a discount when they place an order. If so, good for you! If you analyze customer information at this company, great for you! You have the inside track to fascinating information. You're likely to have a merchandising team that has passion for the products they offer. This merchandising team might believe that they are just a competent marketing team away from having tremendous success. Identify how many employees you had last year at this time. Identify how many employees you currently have. Somebody in Human Resources would love to help you identify an accurate number! Sum total demand from employees during September 2007. Sum total demand from employees during September 2008. Calculate spend per employee, September 2007 and September 2008 (i.e. $10.00 in September 2007, $8.50 in September 2008). Calculate comp employee sales ($8.50 / $10.00 - 1) = -15%. Twice in my career I was pummeled by a merchandising executive for being a lousy marketer. Twice I ran this series of queries. Twice I observed that employees didn't like the merchandise any more than customers liked the merchandise. Twice I ended up with a grumpy merchant, unable to blame marketing for sales shortfalls. There are few things in database marketing more convincing than the sales generated by employees. If employees don't believe in the merchandise, how the heck are customers supposed to believe in the merchandise? Each business model has unique dynamics. You can find low prices at Wal-Mart, or you can buy exotic items at Neiman Marcus. Within each business, however, there are five ways that we generate demand. We'll rank each method on the basis of overall profitability.. Method #1 = Organic: There is nothing more profitable than organic demand. When you want to purchase an MP3 song and you go straight to Amazon.com or iTunes to purchase the song, you are generating organic demand. It's awfully difficult to generate organic demand, and we spend almost no time as marketers figuring out how to encourage customers to do this, a shame. Method #2 = Social: Here's a method that we're getting better at. Social shopping combines word of mouth and social media and any viral strategies that essentially have no marketing cost. Whether it is an employee blog from Patagonia or an iTouch review on Crutchfield, customers are doing the marketing for the marketer. Again, this is a highly profitable way to generate demand, but it is awfully difficult to get customers to do the work for you! Overall, we're terrible at this, aren't we? Method #3 = Algorithmic: We're all heading down this path, and we're all going to rue the day we gave control of our business to algorithms. Catalogers are miles ahead of other brands on this one, yielding control of customer acquisition to co-op statisticians while at the same time working on SEO strategies that game Google into a favorable position. Small online brands exist almost entirely because they can game Google. The more that companies figure out how to game algorithms, the less effective this form of demand generation becomes. The algorithm forces us to do things we wouldn't normally do. We have to write code in a certain way to make sure that the algorithms give us a fighting chance. We beg for links on other sites so that the algorithm likes us better. We change our behavior to make good with an algorithm. Long-term, this is a bad thing, because as computing moves into the cloud, we continually lose control --- the cloud becomes a self-organizing force that dictates our fate. Method #4 = Advertising: Here's where marketers get to have their say, eroding profit margins while creating demand. Paid search, e-mail marketing, portal advertising, catalog advertising, postcard marketing, radio/television/newspaper advertising, you name it, it falls into this category. The goal, of course, is to get the customer to buy something that the customer wasn't necessarily planning on buying, or to make the customer aware of options the customer didn't know she had. This style of advertising is dying. Customers have been lied to and cheated and manipulated and over-hyped for so long that they've become downright grumpy about advertising. Still, this is what we've been taught, so we continue to execute it, and we'll continue to execute advertising as long as Wall St. demands that sales increase every single quarter. Method #5 = Begging: Oh, we're really good at this, and we're really good at integrating advertising and begging! Select items up 60% off, or free shipping this week only (even though there will be a free shipping promotion starting mid-week next week), or take 20% off your order of $150 or more, or the biggest sale of the season, we know how to combine words and discounts and promotions to create demand. Of course, begging has limits, because we don't beg on a 1-to-1 basis, do we? We "market" a promotion to a "target audience", causing customers who would have ordered via any of the prior four methods to take advantage of begging. We also teach our customers to expect us to beg to them, ruining e-commerce. These days, Multichannel Forensics projects focus on the five methods of demand generation. Channels seem to be becoming less important, while migration of customer activity from begging to organic or organic to begging becomes essential to understand. We've been repeatedly manipulated to believe that customer interaction with channels is "where it is at", when in reality, our ability to manage demand across these five dimensions matters more, and is more actionable. A simple scorecard is all one really needs to understand how the business is evolving. The key is to understand how each method of demand generation is evolving. In this case, 2008 is a year of heavy discounts and promotions, significantly increasing the "begging" demand generation channel. Notice how customers are leaking out of advertising, into algorithms. The database marketer measures the long-term value of customers purchasing from each demand generation method, using Multichannel Forensics to understand how customers migrate between each method. We want to understand the long-term trajectory of the brand on the basis of these critical methods of demand generation. A final note --- we need to become much, MUCH better at figuring out how to generate demand via organic or social methods. Ok, time for your thoughts. Do you view the world in this manner, or do you have a different method for thinking about demand generation? Another place where catalog marketing matters is along Highway 101, from north of San Francisco, into Southern Oregon. In this region, customers are not offered the variety of retail brands available in San Francisco, Los Angeles, or San Diego. The lifestyle is different, more relaxed. Again, when marketing to existing customers, we have enough information to infer channel preference. 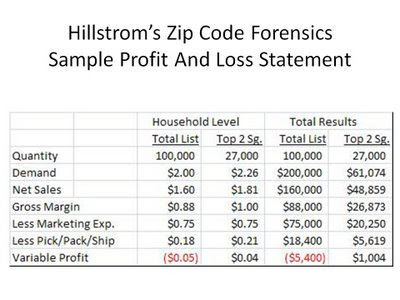 But when marketing to prospects, we can utilize Zip Code Forensics or internal zip models to improve our chances. Just a few hours south of Boston, we find a quaint little world known as Cape Cod. 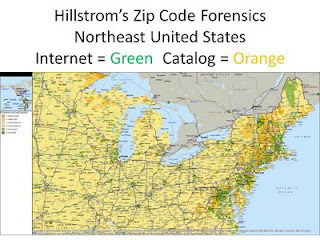 Hillstrom's Zip Code Forensics suggest that this corner of the world is home to some of the most productive catalog customers in the United States. 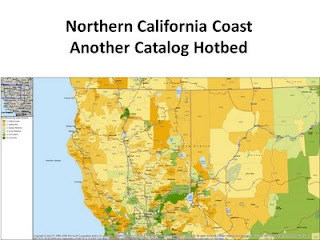 With limited retail options and a less hectic lifestyle, catalog marketing is perfectly suited to individuals who choose to live in this area. This is our opportunity. We identify areas where customers have specific marketing preferences, then we capitalize on those areas. When we have actual customer data, we leverage that. When we are mining prospects, we use Zip Code Forensics or internally built zip models to improve productivity. 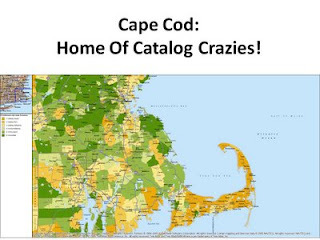 More grumbling about catalogs from a blog hosted by a trade journal that used to be called Catalog Age --- the same trade journal that now co-sponsors what was formally known as the Catalog Conference. It is so easy for all of us to pick on companies. Try running a marketing department at a big company someday --- seriously, if everybody in the world is so good at pointing out all the flaws at big companies, then have the courage to go fix those problems at big companies. Or go work at a catalog brand and evangelize your message about the waste of this style of advertising --- prove that your commentary matters. We all (me too) need to stop flapping our gums about how flawed everybody is, and actually go out there and solve some problems for once, or start our own company, one that is perfect in every way. Addition Four Hours Later: Ok, I re-read this, and it is grumpy and preachy. Folks are 100% allowed to have their opinion, and they are under no obligation to prefer various types of marketing, regardless of the company they work for. It is just way too easy to preach these days, way too easy to be right. It is so much harder to make things happen within a company than it is to point out flaws from outside of a company. I do this, too, I'm guilty. If you have a presence on twitter, squidoo, blogs, facebook, myspace, linkedin and 20 other sites, the chances of finding critical mass at any of them is close to zero. But if you dominate, if you're the goto person, the king of your hill, magical things happen. One follower in each of twenty places is worthless. Twenty connected followers in one place is a tribe. It's the foundation for building something that matters. This is the essence of being a multichannel marketer, isn't it? We're told that we have to be in mobile marketing, social media, e-mail marketing (best ROI, right? ), pay-per-click, SEO, affiliate advertising, shopping comparison sites, portal advertising, catalog advertising, retail stores, radio advertising, television advertising, newspaper advertising, eBay, blah blah blah blah. Almost nobody has been able to demonstrate that actively being in all these channels increases sales and profit for the corporation at a rate that is greater than being outstanding in just one channel. "You never want to chase your market. It costs money to chase the market; it costs much less when the market chases you. That difference in cost is pure profit." There's nothing wrong with having multiple channels, we need to have multiple channels. But when we chase channels as a solution, we lose. Bob Lefsetz positions the challenge another way via the music industry. "We’ve moved on to a new marketplace, where iPod penetration is gargantuan and the CD is antiquated, a worse fit for the times than network television shows. The goal is to get on someone’s iPod, how do you do that?" Doesn't that sum up multichannel marketing in a nutshell? We chase channels. However, the goal is for us to have our brand appear in someone's browser, how do we do that? How do we do that? Not by diving into mobile marketing because it is the next big thing, or e-mail marketing because it has the best ROI, but by understanding the needs of our customer, allowing our customer to "pull us in" however she wants, not by pushing fifty-four channels at her, or by pushing fifty-four versions of one channel at her. When we view the challenge this way ... "the goal is for us to have our brand appear in someone's browser, how do we do that? ", a whole new world opens up for us. I don't force you to visit my blog. 80 out of every 100 folks view the blog in an RSS reader, 40 out of 100 via Google Reader. I don't force you to consume the information the way I want it consumed. I'm blessed to know that, for some reason, this information appears in your browser. Being Multichannel means that we create an environment that allows the customer to pull us into her life. Being Multichannel does not mean that we pummel her by pushing channels at her. One of the blogs I enjoy following in Google Reader is the Get Elastic Blog. In my opinion, these folks do a really nice job of trying to help us improve business performance, and they generally call out positive things that people are doing, rather than tearing down folks who fail. Sure, I disagree with some of the things they talk about, but that's to be expected. I wish more vendors put a human face on their efforts in the way that these folks do. Amazon Shares Tumble ... How To Stimulate E-Commerce? Amazon warns of a tough Q4 --- shares tumble. Here's the real question that we have to wrestle with ... a generation of marketers have been raised online, where the greatest organic demand updraft in direct marketing history made us all look like we were brilliant. Do we have any online marketers who know how to create demand when organic traffic declines? The real magic is about to begin, as a few talented online marketers will figure out how to create demand, while everybody else continues to attempt to game an algorithm named Google. Use the comments section of this post to list the online marketing leaders you think will be able to create demand. Or share with us how you will create demand without having the money available to do traditional marketing! This site was promoted on a popular third party opt-out service blog. The site returns the favor today. There's several million people out there who hate marketers of our ilk. The hate is growing, especially in the past twenty-four months. While not necessarily due to causation, it is worth mentioning that as we swing our customer acquisition efforts to co-ops, we seem to absorb an increasing amount of venom. Contempt happens when we send catalogs to folks who don't want them, and that happens in the realm of customer acquisition. Our job, over the next twenty-four months, is to identify ten or fifteen micro-channels that allow those who want to shop with us to purchase, while reducing customer acquisition efforts among those who feel contempt. Is this easy to accomplish? Heck no! Is it necessary? Absolutely. There's plenty of things to be angry about in the world. Seeing your 401k drop in value by 40% is a bit more troubling than finding an unwanted catalog in your mailbox. Selling your home for a loss and having to bring $100,000 to close is a bit more troubling than finding 40 unwanted catalogs in your mailbox. Sometimes we need to have a little perspective. But we can (and should) do a much better job of minimizing the negativity spread by those who are upset with us. Our co-ops can help us by using their modeling genius to create "synergy" models that identify folks who hate us, suppressing these folks from our mailings. Wouldn't it make sense for the co-ops to import third-party opt-out service lists, model those names and identify similar ones likely to hate us, and create a suppression list that we avoid? It's the same principal used in finding the best customers to mail, why not use the methodology to find the folks most likely to hate us? And why not sell this list to us --- the "hate list", folks who hate getting rogue catalogs in their mailbox, even if they get the rogue catalogs because they've ordered from catalog brands in the past? Charge us for a suppression list of folks who are likely to hate us --- and we can save $$$ and allow the haters to spend time hating something else. If this service is being marketed by one of the co-ops, please leave a comment, and I'll contact the co-op to give them a bit of publicity. It's my birthday, so I get to pick an unusual topic! Assuming Wikipedia is correct, we can draw considerable inferences from the history of Soap Operas. Going back to the early 1950s, Soap Operas have been a staple of afternoon network programming. 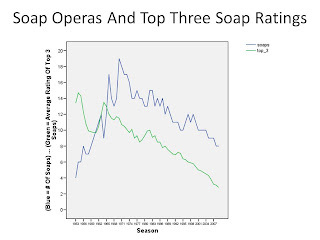 The image below illustrates two trends --- the number of afternoon network Soap Operas, and the average rating of the top three Soap Operas. Notice the trends. 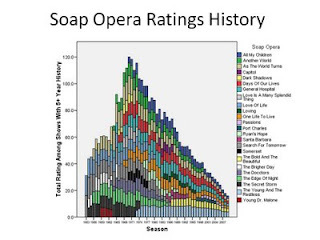 Soaps increased from just four in 1953 to a peak of nineteen different shows in 1970. During this time, ratings were generally on the decline. A brief surge in ratings around 1980 (Luke and Laura on General Hospital, I am told) fueled a short-term increase in the number of shows. But as ratings decreased, shows were cancelled. Another brief ratings burst in 1993 - 1994 led to one final surge in the number of shows. Notice the lag in ratings and shows. When ratings improve, there is a one or two year gap until new shows come in to capitalize on increased ratings. By the time the new shows arrive, the ratings bump is gone. We multichannel marketers know this trend all too well, don't we? Something works well in a catalog --- by the time we capitalize on the trend, the trend is already over! We have such an opportunity to use the online channel as our channel of experimentation --- test, learn quickly, iterate, evolve --- using print to capitalize on the immediate learnings available online. Our method of measuring "winners" must change, must become more flexible, so that our survival is guaranteed. Also notice that ratings are absolutely awful --- in an irreversible downward decline that shows no hope of changing. This isn't any different than the downdraft observed in telephone sales. Sure there are blips from time to time, but on average, there is no stopping this trend --- the genre is dying, just like catalog marketing is dying. Next, take a peek at the "death" rate of new shows during the past fifty-plus years. The dark bars indicate the likelihood of a show being cancelled in any given year, provided that the show survived up to that point. The lighter colored bars indicate the cumulative probability of a show being cancelled by year. What matters here is the steep hurdle a show has to get over to survive. Nineteen percent of shows are canned after just one year, fifty percent of shows are killed within the first three years. If a show could survive the first three years with reasonable ratings, it had a chance for long-term success. The Edge of Night took five years to crack the top three rated shows, then hung in the top three for five of the next twelve years. As The World Turns took four years to crack the top three rated shows, then stayed in the top three for twenty-one consecutive years. General Hospital took nine years to make it into the top three, then was in the top three for twenty-four of the next thirty-eight years. Another World made the top three in year five, staying in the top three shows for eight of the next eleven years. Days Of Our Lives made the top three in season seven, staying in the top three for the next four years. One Life To Live finally made the top three in season fourteen, staying in the top three for six of the next nine seasons. All My Children made the top three in season nine, and stayed there for sixteen of the next eighteen seasons. The Young And The Restless made the top three in season four (1976), and has not left the top three in ratings since 1984. The Bold And The Beautiful cracked the top three in season seven (1993), and has not left the top three in ratings since 1996. In other words, it takes time to build a winner. Zappos is an overnight success, one that took nearly a decade for anybody to notice. Amazon.com was lambasted in the mid and late 1990s for their reckless approach --- now, they own e-commerce, while some of us beg for the opportunity to sell our wares on their site. Look how long it took those folks to build success. And we sit in conference rooms with jaded executives. We describe how we want to experiment with channels, only to have power brokers tell us "we tried that in 1997, it didn't work then, but somebody at a research organization published a $389 paper that says we should align all of our merchandise across channels, so by golly, let's invest in the information systems that allow us to do that, and then we'll innovate." Notice that once a show "made it", the show stuck around. Humans are creatures of habit, it takes something innovative (or more important, something our friends talk about) to knock us out of established habits. But when we're knocked out of an established habit, we generally don't go back to what we used to count on. Take a look at these shows. Search For Tomorrow was a top three show from 1953 to 1966. After dropping out of the top three in 1967, the show only had two additional top three appearances before being cancelled in 1987. The Guiding Light, still on television today, was in the top three every year from 1954 to 1968. The show experienced two top three performances between 1969 and 1977. The show has not been in the top three in the past thirty-two seasons! As The World Turns dropped out of the top three in 1979, appearing only once more, in 2008, at a time when one-fourth of the audience is left. General Hospital and Days Of Our Lives have been able to survive problems. GH survived slumps from 1974-1978 and 1996-2000. Days survived a twenty year slump from 1976-1995 (but never had bad ratings during that time), and has only been in the top three once since 2002. One Life To Live has not appeared in the top three rated shows since 1989. We experience these trends all the time in our businesses, don't we? Sears and K-Mart are like One Life To Live --- consistently declining comps, but churning out too much cash to kill outright. 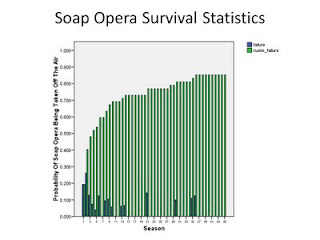 The data indicate that it is very hard to turn a floundering Soap Opera into a perennial favorite. Retail is littered with comparable trends. When Eddie Bauer comps turned negative in 1998, there were a few years when comps turned positive --- but positive comps weren't sustainable, and were offset by huge declines in performance. When momentum works against you, it's downright difficult to reverse the mojo. Those who are able to reverse momentum are gifted --- those who reverse momentum at multiple companies should be in the Direct Marketing Hall of Fame! Quick, name an executive who fixed two companies in a sustainable manner? We have merchandise lines that exhibit these trends too, don't we? At Nordstrom, we sold stirrup pants --- store managers and merchants HATED stirrup pants --- yet we had a passionate and decreasing niche of customers who craved them in catalogs. Multichannel pundits might suggest that we offer this merchandise across all channels, yet it may make more sense to bury the product in catalogs where the product can profitably serve a small niche. Soap Operas are all-or-nothing propositions, they have to be on television every day, every week, without repeats (or do they?). Multichannel merchandising allows for considerable flexibility in the merchandise assortment across channels. We need to merchandise to the customer who is passionate about a channel, not merchandise to the ten percent of customers who shop all channels. Whoever made up the rule that we have to serve the ten percent of customers who love shopping all channels? How did that become a best practice? One wouldn't think that Soap Opera metrics are worthy of comparison to the business models we manage. A quick review of the information suggest there's a lot to learn from other disciplines. Added 2008/10/24: Take a peek at the long-term ratings decline --- this image illustrates soaps that were on the air for at least five years, so that you can see the life and death of various shows over time. Again, pay attention to the huge ratings decline --- your thoughts, what becomes of television as ratings continue to implode? Yahoo!, a company that announced profit excluding one-time charges of $123 million dollars in the last quarter, will slash ten percent of the workforce. When job cuts come to Wall St., we hear about how sad it is for those folks. When job cuts happen at Yahoo!, Wall. St. drives up the stock price more than four percent in after-hours trading. Ya-hoooooooo! I've been asked to slash jobs ... 1998, 2001, 2002, 2005. You are assigned a representative from Human Resources. The individual assists with talking points, prepares documents to aid the employee in understanding this "necessary reduction in human capital". Both you and the poor individual in HR greet the downsized employee, asking him/her to sit down. The thought crosses your mind ... "I'm about to destroy this person's life." Then you think, "Who helps the HR executive eliminate an HR position?" Your mouth is dry. No, really dry. You wonder if the employee can see your heart throbbing at 140 beats per minute through your dress shirt? The employee sees a Vice President sitting next to an undisclosed Human Resources representative, with a beige folder opened in front of the seat the employee is being asked to sit in, and immediately gets that ashen look that, as a Vice President, you wish you didn't ever have to see. You're supposed to read from the script, explaining to the employee that external market forces dictate a leaner and more nimble organization, and that unfortunately, as of this morning, the individual is no longer employed by the organization. I've found that it is better to just wing it, to just say what's on your mind. At this point, you lose any ability to predict what comes next. I've had just about every possible scenario happen after uttering the pre-written or ad-hoc paragraph. I've been thanked (sincerely). Crying. Silence. Anger. Fist-smashing anger. Fear for my own safety (I've had security assigned to protect me from a potentially dangerous employee). Questions about how the employee will make rent payments. Questions about how the employee will pay for health care for her sick child. Disgust. One employee told me that s/he thought I was a mentor, somebody s/he could believe in ... prior to today. Honestly, I cannot judge one single response. They're all valid, and understandable given the circumstances. The first time you go through the exercise, you want to throw up after the employee leaves your office. By the time you've destroyed the lives of a dozen folks, you simply appear cold and unfeeling. Cold and unfeeling is a coping mechanism that only heightens the frustration of the employee being terminated. When somebody from up high (a VC, a Board Member, the CEO, or an EVP) unilaterally decides to crop ten percent of the workforce, and makes you do the dirty work, you feel a bit of resentment. The employee feels a lot more resentment than you do. And in 2008, the terminated employee must feel a rage that is unique to our business era. You stayed with the company through positive comps and negative comps. You stayed with the company even though the company only increased your salary by 3% a year, suggesting that you were "in the upper quarter of your salary band". Salary bands are the worst thing to ever happen to hard working employees. You dutifully contributed to your 401k account, supporting the company initiative to be "Healthy, Wealthy, and Wise", only to learn that, through no fault of your own, forty percent of your retirement money is now gone. Imagine being in your late 50s or early 60s right about now? You dutifully contributed to your employee stock purchase program, only to see the value of the stock you purchased drop by 67%. You could have got braces for your child, but you caved in to management's request to invest in your company, to "demonstrate" to Wall St. that you believed in your company. Now that things went sideways, is Wall St. (or your Sr. Management team) there to demonstrate that they believe in you? You trimmed expenses from your budget so that your company could "make the third quarter numbers" promised to Wall St.
You stayed loyal to your company, because relocating would have required you to sell your home, and your home is now worth only 70% of what it used to be worth and there are maybe two qualified buyers out there looking for a new home. You worked 60 hours a week to get that information system implemented, the system that the company now says provides enough efficiency to eliminate costly human capital. You listened to the IBM commercials that suggested you work in an "on-demand" environment --- an environment that worked wonders for the profit and loss statement until your Sr. Management team built an entire business ecosystem off of on-demand easy credit that no longer exists due to no fault of your own, throttling the ability of your business to operate efficiently. Yup, that's you. You did all of those things to support your brand. And now, all across America, folks like you are being terminated, all in an effort to help the brand meet quarterly profit projections demanded by Wall St. We're sold the excuse that the cuts help the brand become more nimble and responsive.